Dance, scream, jump, sweat, clap hands and wear out your feet. Italian celtic-rockers The Rumpled come wrapped up with heaps of enthusiasm and energy and on hearing this they will soon have you trapped in their spell! If you ever think that celtic-punk music is confined only to the Celtic nations and the Celtic diaspora then you couldn’t be more wrong! Those days are long ago, if indeed they ever really existed at all, and these days celtic-punk music is spread literally all over the globe. Today’s review is of Italian band The Rumpled’s debut album Ashes & Wishes and if celtic-punk was designed as a vehicle to take elements of traditional Irish folk and punk rock and blend them together while staying true to both genres roots then The Rumpled have nailed it. 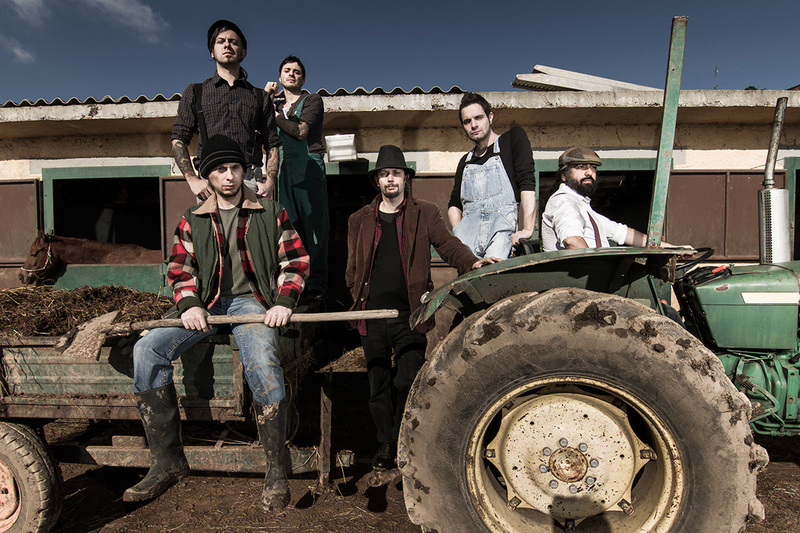 The band was born in 2011 in the northern Italian city of Trento and began with the name Seven Deadly Folk but as is often the way with celtic-punk bands with the coming and going of new and old members the band decided in 2014 to change their name to The Rumpled. This led to the release of a 4-track demo in June 2015 and the change of name did them no harm and in the summer of last year they won the prestigious European Celtic Contest organized during the Montelago Celtic Festival. Having already performed over a hundred concerts at pubs, festivals, on the street and many more unlikely places and with this award under their belt and the release of their album last month they set off later this month on their biggest ever tour of Italy. The celtic-punk scene in Italy leans very heavily towards the Irish side of things and in bands like The Clan and Uncle Bard And The Dirty Bastards Irish traditional folk music is referenced heavily. Another band I have started to notice being referenced quite often, and for good reason, is Aussie celt’s The Rumjacks. Kicking off with ‘Rumpled Time’ and its catchy, riff laden, accordion led celtic-punk heaven! Its more the folky side of things but still with plenty of bite to it and, in common with the above Italian bands, Marco, the vocalist, has a strong voice and when singing in English is perfectly understandable. Following this is ‘Just Say No!’ and the Irish influence is strong on a song that bounces along with tin whistle leading this time. So far the emphasis has been on good time music but the Bhoys ramp it up for ‘Jig Of Death’ and was the second single released from the album the week after St. Patrick’s Day. According to the video the ‘vocal supervisor’ was one Francis D. McLaughlin so we could have half expected them to singing in broad Scots! Another thing they have in common with The Clan is their elaborate and well made videos. Take a few minutes to check them out as they are well worth your time. The album carries on with ‘I Wanna Know’ and by know I’m getting the vibe off them that they are very much a live band. Music like this belongs in the public house but they have made a very decent job of transferring it onto disc so well done lads. The Rumjacks connection continues with ‘The Ugly Side’ featuring the Rumjacks themselves. Don’t these guys ever intend returning to Australia?? One of the punkier songs on Ashes And Wishes but without losing any of its catchiness. The bagpipes are loud and proud for next song ‘Don’t Follow Me’ the video of which features the local Celtic interest group Il Clan della Fossa. This was the lead single released last November and sparked up a lot of interest in the band around Europe. As I already mentioned Italian celtic-punk bands have really embraced the sound of trad Ireland and on ‘County Clare’ The Rumpled take that music and inject it with a healthy dose of punkiness and an energy oft times missing. The song is again led by the accordion and Marco’s voice combine for the album standout for me. The album continues with ‘Bang!’ and a catchy ska beat knocks shoulders with a country folk base and nice wee track with very well played fiddle from Patrizia. We are nearing the end and still no covers just some excellent original celtic/Irish influenced folk punk. ‘Dead Man Runnin’ continues the punkier side of things before ‘Ramblin’On’ brings us back to their more folky side. Again its catchy as hell and finally the album comes to an end with ‘Letter To You’ and if the only thing missing from Ashes And Wishes was a lovely wee ballad then they almost pull it off with this wonderful song that they can’t quite help sticking a jig in the middle of it. The sort of song Springsteen would do if he ever records an Irish themed album. Ashes And Wishes is a real fun album the sort of music that would see you certain of a good night out among friends and comrades. With the spirit of great Irish bands like The Dubliners, The Pogues, Dropkick Murphys and Flogging Molly infused here celtic-punk is not a genre built entirely on originality in fact it skates by on a massive dose of nostalgia as much as anything else. In which case it’s sometimes hard to judge bands and with the best place to hear this kind of music being the pub its the feelings it evokes that tell us whether the music is good or bad or in between. What you have here is just plain good old time party music. There is no hidden meaning to it just the wish from The Rumpled for us, the listener, to enjoy ourselves and to forget our troubles. Which is exactly what I did for thirty-four minutes!! The Moorings. As recommended by The Dubliners! An ultra-energetic French quintet delivering a fantastic mix somewhere in the middle between celtic folk and alternative rock. So I was always told my auld fella that you should judge a man by the company he keeps. He used to say this to try and get me to stop hanging about with some rather unsavoury characters in my home town. If you can apply the same to bands then The Moorings are a band that any parent would be happy to see you associating with. They are basically the first port of call for any of the celtic-punk scenes major bands when they arrive in France and are looking for supports. They have played with just about every decent sized band going and as says above recommended by The Dubliners. They have toured with just about all the greats of Irish punk from The Pogues to the Murphys to The Dubliners. Their last EP even had guest vocals from Frankie of The Rumjacks. Formed in 2011 in the small town of Sélestat in the north-west of France on the border with Germany The Moorings assent has been spectacularly quick and without even having released an album. 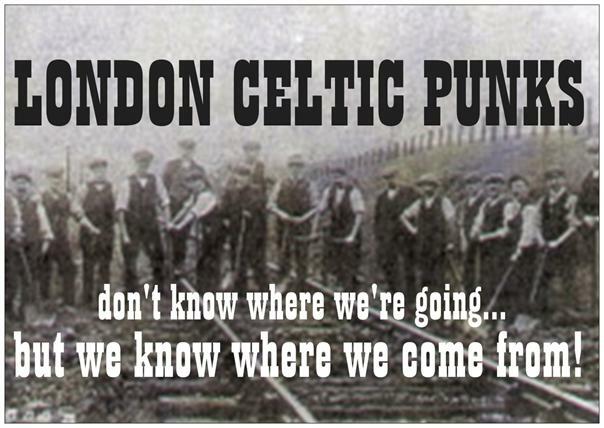 Their debut EP ‘Pints And Pins’ from July 2011 introduced them to the wider celtic-punk world and received praise from all and sundry. Five mostly self penned tracks including the brilliant ‘Working Class’ which gave up plenty but promised so much more as well. This was followed up with a live album La Cigale Unplugged. Again mainly self penned its eight tracks that show how good The Moorings are as both a band and as individual musicians as well. The superb production helps and on hearing the album it’s easy to see why they chose to release it. Their third and final release was another EP. This time ‘Nicky’s Detox’ EP from December 2014 really showed what they could do. Five tracks all written by the band that again received glowing tributes from all the regular celtic-punk press including ourselves here. The song that really raised interest in the band, ‘Shandon Bells’ features Frankie McLaughlin of The Rumjacks on guest vocals and made it onto just every celtic-punk podcast in existance. So Unbowed is the band’s first proper studio album but will it live up to all the hype? The answer is of course most certainly. Twelve tracks that last over forty minutes and show The Moorings haven’t rested on their laurels and continue to make utterly brilliant music. The album kicks off with the hilarious ‘Another Drinking Wound’ and anyone whose ever had a, what we Irish call, a “very good night” can attest to waking up the next morning with unspecified bruising and a lack of memory of how you got them. The song starts with some great rock’n’roll guitar and a brilliant catchy start. D.Phil.Jelly sounds just like our Shane even including his cockney sneer! It’s fast and not particularly folky but ‘Captain Watson’s Gang’ introduces the first of that quieter numbers. Be moaning the turn of the world to the worship of money. I say quiet but not really. Great drumming here that keeps the song flowing along. They enter a world unbeknown to me next with ‘Amsterdam’. Originally recorded by the Belgian singer, songwriter, actor and director Jacques Brel. The song is in French and has that ‘Parisian’ feel to it due to the style of accordion playing. A lovely song and picked wisely as it would please both their audience at home and abroad who are jaded at hearing the same old covers over and over again. Delivered with The Moorings stamp it’s a great song and builds to a crescendo before the banjo slows it all down and takes us into a instrumental, ‘The Dancy Cargo Hold’s Dance/ Mermaid’s Jig’. As was showed with that live album the y can certainly turn their hand to a traditional folk song and I’m sure live this is a guarantee to get the audience on their feet. Both part’s are fiddle led with subdued quiet backing except for military style drumming. Great stuff! The Moorings like the name suggests like a sea bound song and here’s the first one, The Mariner I Used To Be’ begins with tin whistle and it’s a slow’ish’ ballad telling of a sailor whose had enough of the hardships of the sea and decides to settle down with his new love. Another song in French follows with ‘Les Bras Piqués’. Can’t tell you what it’s about but it’s a fair corker of a song moving at a fair old pace once it gets going. ‘Drink Up Fast’ was the first release from Unbowed and came accompanied by the brilliant video below. It’s no wonder that celtic-punk gigs are so beloved and greedily anticipated by landlords with this amount of drinking going on! Shouty vocals and fiddle led folk-punk that’s a real thigh slapper. and then we are finally at the end and Unbowed comes to end with the album’s longest track ‘Invictus’, starring Marikala on guest vocals. A great song with positive life affirming lyrics that begins with tin whistle this time supplied by Lolc from fellow French celtic-punkers Celkilt. Mainly accordion led but as has been the way throughout D.Phil’s voice stands out in particular. Another album highlight here and a simply fantastic way to bring down the curtain on Unbowed. If this album has one lighter/ pint in the air moment then this it is. Singer/guitarist D.Phil Jelly has done a great job on this album overseeing just about everything here and the sound is crisp and never once over produced. The biggest danger in celtic-punk is that the folk instruments are completely submerged or else turned up so high to compensate that all you can hear is the tin whistle. No danger of that here as the balance is perfect between the punk and the folk. the songs are never straight forward celtic-punk and there is plenty influence of their home countries indigenous music also. The Moorings have always been one of the more interesting bands in celtic-punk with their appeal overlapping several genre’s I am sure. This is a great album and one that will further cement there place as one of the best, and more innovative, bands in the scene. as influenced by AC/DC , punk rock and Irish folk music! From the small town of Muggiò in the province of Lombardy in the north of Italy comes another great Italian celtic-punk band The Clan. Formed only last year their recently released self titled album has gone down an absolute storm across Europe with its punk energy and Irish spirit. Coming along at roughly the same time as another Italian bands latest album The Clan have a lot of similarities with Uncle Bard And The Dirty Bastards (album review here) so maybe there’s something of an Italian thing going on . For sure theres always been a lot of traffic between Ireland and Italy and so only natural some will find solace in Irish music. It’s clear that Italy’s top celtic bands The Clan, Kitchen Implosion, Dirty Artichokes and Uncle Bard all have the same deep love for Ireland and it’s musical traditions. What we have is twelve tracks of which half are covers. Their choice of covers is pretty basic with plenty of celtic-punk’s standard songs- ‘The Wild Rover’, ‘Fields Of Athenry’, ‘I’ll Tell Me Ma’ etc.,- but all are done with appropriate gusto and superb musicianship. Still would have been nice to hear some less covered covers but I can understand their choice as the album is for the Italian market primarily and these songs won’t be so well known. These are all great songs which is why they get covered so much. Hopefully on their next album they can change it up a wee bit. The band have all your usual instruments plus fiddle , tin whistle and bagpipes and as is usual the playing is absolutely superb. The band do not miss a note and the production is spotless with the band guiding each other perfectly with nothing too high or too low and nothing over dominating. A haunting pipes and drums intro leads into ‘We Are The Clan’ a DKMish shoutalong introducing themselves to us with a loud punk rock song accompanied by just as loud fiddle and tin whistle! The first of the covers ‘I’ll Tell Me Ma’ comes next and even though it has been played pretty much to death it still sounds pretty damn fresh here and The Clan get away with it by giving it enough of their own stamp to carry it along. ‘Irish Rock Jigs’ follows and really does show The Clan’s influences stretch a lot further than AC/DC! With the reels spilling out you can close your eyes and imagine you’re in Ireland listening to the ‘real deal’. The addition of uilleann pipes really sets it aside and images of The Bothy Band and Moving Hearts come to mind. ‘Whiskey In The Jar’ we’ve all heard before but the bagpipes and punky guitars drive it along nicely. ‘Paddys Day’ is the first of The Clans originals and is a fine ole song. Tin whistle is to the fore in a song celebrating that best of days! ‘Throat Of Devil’ has Lorenzo Marchesi of folk-metal legends Folkstone guesting on medieval pipes. Certainly the fastest of the albums songs and the standout track for me. The bands quality shines through and is as catchy a song as you will find on any celtic-punk album of 2014. ‘The Irish Rover’ is punked right up and led by the fiddle. Angelo’s vocals are crystal clear and completely suits the music with just enough anguish and shoutyness. ‘Joseph, Mary And Son’ has a sort of bluegrass feel to it due mainly to Laura’s excellent fiddle. The story of the immaculate conception put together with great gusto and backing. ‘Fields Of Athenry’ begins quietly and as impossible as I would think it would be to give it any sense of originality The Clan give it a go and come as close as any to manage it. As amazing as it is this song was only written in 1970’s by Pete St.John and contrary to popular believe is not 150 years old. I once went to Ireland as a kid for the summer holidays and Paddy Reilly was #1 in the charts with it. I went home and came back the following summer and he was still #1! ‘More Than A Lie’ shows the band can do and write some downright brilliant celtic-punk material of their own. The bagpipes rule loudest on ‘The Wild Rover’ bringing a great shouty end to the album. Twelve tracks at just under forty minutes and not a single duff one among them. I will never cease to be amazed at the quality of the writing, the vocals and the musicianship of the bands within celtic-punk. The CD comes in a nice wee digipak with an illustration of the band by The Rumjacks lead singer Frankie. Altogether a fantastic first album from The Clan though I look forward to hearing their second album with more original material though do not think this is purely an album of covers. Their own material is great and the covers they do do have The Clans stamp all over them and believe me well thats good enough for anyone. “Anyway, during those years we started collecting money and traveling once a month to Ireland, to meet old friends living there and spending the weekends rambling around and enjoying Irish music, culture and people. So in 2007 the boys got together and with just a handful of songs set out on the path that would lead them all over Europe playing with not just the celtic-punk scene’s best bands but also some of the traditional scene’s as well. From dingy wee pub backrooms to rock festivals to mountain huts the bands brand of Italian celtic-punk has gone down an absolute storm everywhere they have set foot. Back in 2012 after the release of their first album ‘Drinking Not Thinking’ they set out on a busking tour of Ireland, Wales and England joining local musicians singing old-time stories on street corners. Returning home they were joined by world renowned Irish folk musician Luca Crespi who added uilleann pipes, tin whistle and the Irish flute to the bands repertoire. ‘Up The Bastards’ EP followed last year which brings us nicely up to date with the recently released album ‘Get The Folk Out!’. The band members are Guido Domingo- vocals, acoustic guitar, bodhrán Lorenzo Testa- tenor banjo, mandolin, vocals, spoons Luca Crespi- tin whistle, uilleann pipes, Irish flute Silvano Ancellotti- electric and acoustic guitar, coarse vocals Uncle Bard- bass guitar, lamenting vocals and Francesco Fabris on drums. Lorenzo is the band’s main songwriter but most of the group have also written a song or two and all contributed to the songwriting process. (from left to right): LUCA, LORENZO, FRANCESCO, GUIDO, SILVANO, ROB ‘Uncle Bard’. The album is in fact a masterpiece. It straddles nicely both Irish trad and celtic-punk and easily fits into both genre’s. The addition of uilleann pipes moves the bands sound into something quite incredible. From the very start of the album as soon as ‘The Road’ kicks in with tin whistle and vocals soon joined by a whole host of Irish instruments showing that Uncle Bard And The Dirty Bastards surely know their onions. The following ‘Black Sheep’ is a bit more celtic-punk and more reminiscent of the Molly’s or The Tossers. Normally we would try to give you a real feel for the album by going through all the tracks and giving you a wee description of each one but there’s not much point with this as it would just say “absolutely fecking brilliant” after each track title. As hard as it is to pick a few standout tracks on this amazing album ‘Green Shamrock Shore’, is one of them, about the death of the celtic tiger and the beginning of the end of Ireland’s boom years and sadly the end of Rob’s time in Ireland. A track laced with sadness but sung in that pint in the air way that fills both yer heart and yer ears. Even more incredible than the high standard of the music is that its mostly their own work too. Only two tracks are covers ‘The Raggle Taggle Gypsy’ and the Man In Black’s ‘Ring Of Fire’, both of which are suitably twisted and turned by the band into something new and fresh and as far away from bog standard covers as could be possible without changing both the words AND the tune! 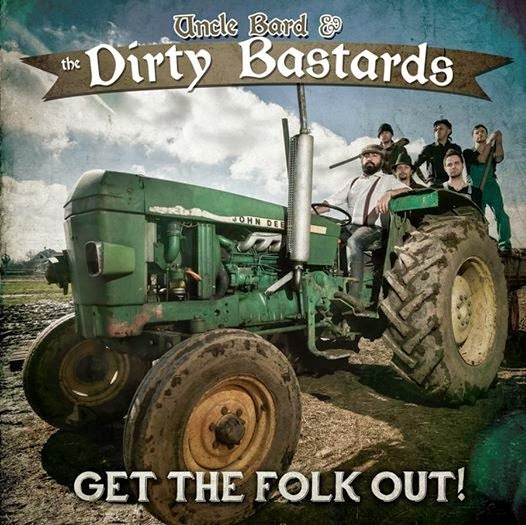 Influences abound from Planxty to The Chieftains to the aforementioned Tossers and Flogging Molly but Uncle Bard And The Dirty Bastards are pretty well unique in the Euro celtic-punk scene and deserve to be fecking huge worldwide. Hopefully this album will achieve that. ‘Blue Velvet Glove’ showcases Luca and his haunting expertly played pipes. The songs last only two or three minutes each but there’s so much going on its hard for this reviewer to keep up. ‘The Rambling Bhoys’ is typical of the album with a lovely tune, clear and well sung vocals with lyrics you can easily understand. ‘Skedaddle’ is another great example, fast- slow- fast- slow the perfect song for having a breather and catching your breathe on the dance floor in between going nuts, spilling yer pint and bashing into people. ‘I Only Got One Pint’ is another Uncle Bards classic as is the following ‘Off In The Jacks’. The album ends with ‘Be’ the longest track on the album and begins with just vocals and mandolin before the band kick in and fill the air with the swirling sound of brilliantly played slow tempo Irish folk. With fifteen songs that come in at just under a hour, the CD also comes in a very nice digipak with a whopping 16 page booklet including the song lyrics, pictures of every band member and some excellent liner notes containing introductions to all the songs. Do yourself a favour and fork out the bit extra hard earned for the CD copy of the album, you’ll not be disappointed. Been playing this on repeat and from that very first moment it stills sounds as fresh as it did on that very first play. From the first few bars I realised I had come across something special. This is already my celtic-punk album of the year and I doubt they’ll be one better along anytime soon. The boys have an extraordinary feel for playing Irish music and I can honestly say I have never heard a non-Irish band sound so authentically Irish. I will be playing this for a long time yet and i simply cannot recommend enough that you get yer mitts on this album. If you don’t think it is “absolutely fecking brilliant” as well then you really have no place coming here! So there they are, seven years and counting… still roving, still playing. And surely we can be grateful… too old to stop now! the ever always excellent Spanish blog ‘Celtic Folk Punk And More’ also wrote a review of the album here.